The selfless sacrifice of the millions of United States citizens that have volunteered to serve makes the United States military the world’s finest. And veterans are better citizens and more valuable members of the workforce and our communities in many ways because of the skills and character they learned through their service. Long View RV would like to thank all members of our military service. There are lots of ways to thank a veteran. A simple sincere “thank you” works for most members of our military. Volunteering in your community is a great way of showing indirect gratitude, since not everyone can enlist and serve. Exercising your right to vote is another big way to say thanks. Especially when you stay informed and vote for representatives that take veterans’ issues seriously. But it’s difficult for a business to say “thank you” in any way like this. 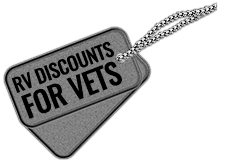 So, at Long View RV all military, active or retired, and their families, get their thank you in the form of a 5% discount when you purchase an RV. Here is how you can take advantage of your Long View RV military service discount. Please print out our military service coupon. Bring it with you when you visit us and present it to your RV Consultant when you meet them. This is how we’ll know that we are dealing with a military service member right from the start. You’ve watched our back. Now we’re giving you a small bit of our sincere appreciation. Thank you for your service. And thank you for choosing Long View RV.